Mr Kenny Chan, store and merchandising director of Books Kinokuniya, insists that he is not a geek. This, despite owning more than 20,000 comic books and having made numerous trips to the annual San Diego Comic-Con International, which he describes as a "mecca for geeks". co-creator of series such as Spider-Man and the Hulk, and his two-hour interview is peppered with casual superhero references (being appointed class monitor in school meant that "I acquired something which Spider-Man also acquired: responsibility"). But still Mr Chan insists: "I don't consider myself a geek. Geeks are not people persons. They're quite ostrich, head-in-the-sand types. I think I'm quite a people person." Mr Chan has parlayed his love of comics into profit. In what he calls one of his "proudest achievements", he has pulled the comics and manga section up through the revenue ranks at Books Kinokuniya. When he joined, the category was ranked around No. 30; these days, it is one of the top three revenue drivers. Books Kinokuniya is now also one of the most successful bookstore chains in Singapore. First opened here in 1983, the Japanese chain now operates four outlets, including a flagship 33,000 sq ft store at Ngee Ann City. It is known for its wide range of books in a variety of languages, including Japanese, French and German. Mr Chan's success at the helm of Books Kinokuniya is no lucky strike. The 62-year-old has been steeped in the books industry for almost his entire working life, and has been involved at numerous points in the process from pen to purchase, such as publishing, distribution and retail. His extensive experience is also twinned with a healthy dose of intuition. When asked how he knew his comic- book bid would pay off, Mr Chan alludes to a 2001 Hayao Miyazaki animated film. "Did you watch Spirited Away? At the end, Chihiro has to identify her parents, who have been turned into pigs, that's the reason," says Mr Chan. "She knew who they were through intuition. For me and comics, intuition played a part." Speaking to Life! in a conference room at the chain's Ngee Ann City store, he gives the impression that, for him, work and leisure are one and the same. He talks about books as if they are old friends and says that he races through two to three hundred books a year. While he enjoys reading comics and fantasy books in particular, he devours "anything", including steamy Mills & Boon novels, business books and magazines. His favourite author is Jane Austen, for her "exquisite writing" and the way her characters are "very universal and relevant, even today". He is as erudite as he is jocular, personable and down-to-earth. His scale of approval seems to run from "cool" to "quite cool" to "very cool", and he takes a child-like delight in cracking jokes and recounting amusing anecdotes. The eldest of three sons born to a housewife and a shipping clerk, he grew up in a rented room in a terraced house in Geylang. Some of his earliest memories are of his mother taking him to watch Indian movies at nearby cinemas, such as Galaxy and Taj. "In those days, we were very good at face-reading. There were no subtitles," recalls Mr Chan. "But that did shape the way I view the world and cinema - with no boundaries." In school, he was always the "rollercoaster kid", topping the class one year and ending at the bottom of the class the next. "I never cared about studying," he says with a shrug. His favourite subjects in school - English, art, history and geography - indicated an early inclination towards the arts. He says: "I didn't like mathematics, but I was okay with science because of comics. In comics, there's a lot of science. I learnt the periodic table from comics." 40 cents. He caught the comics bug from his cousins, who were also avid comics readers. By that time, his family had moved into a three- room Housing Board flat in Queenstown and he remembers making a monthly shopping trip to get his hands on "anything Marvel". He recalls: "Those days, it was very hard to get the whole range in a single shop. The comics were scattered all over, so I would walk from Queenstown estate, all the way down Tanglin Road and the last shop would be at Capitol. So every month I would make that journey, picking up comic books if I had the money." It was also around that time that he began considering a career in books. "In secondary school, I won a literature prize, which was a voucher. I had to go to MPH to turn the voucher into a book and I met the store manager there. I remember saying to myself, and this was a bit of an epiphany, I want to be him." Before entering the books industry, he graduated from the then University of Singapore with a major in political science and economics, and a minor in English. He served as a foreign service officer in the Ministry of Foreign Affairs for six years, before reaching what he describes as the "crossroads of my life". Mr Chan says: "I had a few choices. The general manager of Popular at that time was a former colleague of mine in the foreign service, and at that time, Popular was revamping itself to become a bilingual bookstore. I was offered a job in sales and marketing, and another one in import and export. "But when I came to the crossroads, I thought, why not try something I really loved? That was books and there's been no turning back since." He joined Popular as a merchandising and operations manager, and helped work on the bookstore's expansion into Malaysia. After two years, he was posted to Hong Kong to helm two of Popular Holdings' subsidiaries there - bookstore Harris and textbook publisher Educational Publishing House. After three "frenetic, exciting and fruitful" years in Hong Kong learning the ropes of the books business, he returned to Singapore in 1987 due to his father's ailing health. It was then that he fulfilled his childhood dream. "I finally managed to manage the bookstore that I always wanted to manage - the MPH Stamford Road flagship store." After another two years at MPH, he left and worked at a series of publishers and book distributors, staying between one and five years at each place. In 2001, he joined Books Kinokuniya. "According to Kinokuniya, I applied for the job. According to me, they invited me to join them. You can write whatever version you want." What is indisputable is that his 14-year gig at Books Kinokuniya has been his longest time spent at any job. Mr Rudolf Phua, a book industry veteran and founder of distributor Pansing, says: "After Kenny joined Books Kinokuniya, he was able to put his stamp on the merchandise mix. And that, personally, is what places Books Kinokuniya apart from its competitors - its ability to match its product to its customers' tastes." 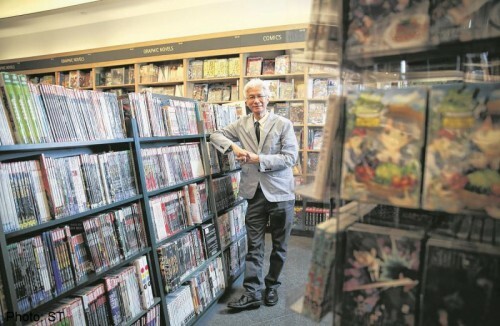 He adds that Mr Chan is "very sensitive to changing tastes and does not hesitate to change the product mix accordingly", citing the huge selection of graphic novels in the store. Mr Chan certainly has his fingers on the pulse of popular culture. During the photoshoot for this article, he grabs a different book to pose with each time the photographer pauses to adjust his equipment. Brandishing a book with English actor Benedict Cumberbatch on the cover, he remarks approvingly that he would make a good Doctor Strange. The actor was recently cast as the superhero in a movie which will be released in 2016. Mr Chan's wife, Ms Sulaimah Mahmood, says he is "intelligent and passionate about his work, comics, travelling and family, though not necessarily in that order all the time". They met when he was working in the foreign service and she was with International Enterprise Singapore. The couple got married in 1992. With Mr Chan's 86-year-old mother and the couple's two children - Nadia, 22, a staff nurse, and Zakee, 19, a second- year drama student at the Nanyang Academy of Fine Arts - they live in a semi-detached house in the Serangoon area. His father is deceased. Fortunately for Mr Chan, his wife is also on board with his comic-collecting habits. "Everyone at home reads either comics or other stuff. Honestly, I wish we could have a huge basement or attic to keep all our comics and books near us for convenience," says Ms Sulaimah, director of the ASEAN division at the Ministry of Trade and Industry and whose age, according to Mr Chan, is "I cannot tell you". Mr Chan keeps his extensive collection in his home and a warehouse, and the last time he counted all his comic books was more than 15 years ago. Some of his most prized issues include the first issue of Conan The Barbarian, some of the early runs of The Amazing Spider-Man and the early runs of Fantastic Four. When asked how much his comic collection is worth, he is not quite sure. "I've never paid a lot of money for them because the way I collect is that I collect for pleasure, so it's never about making money." Neither does he worry about the rise of online retailers, which has been putting pressure on brick-and-mortar shops. He says: "Business has remained fairly stable for us because we have always had a core group of loyal fans. In fact, bookshops have become more relevant and adaptable in meeting the needs of their customers. What the company does best is to connect with customers and I think that as long as we continue to do that, it will be fine." In fact, the store did so well that on the first day of the shop's re-opening after a move from the third to the fourth floor of Ngee Ann City, it posted the highest single-day sales ever, which was in the "multiple hundreds of thousands". That connection with customers is something Mr Chan fosters actively. He is active on social media and posts on Facebook every couple of hours. He also Tweets, maintains a Tumblr and has an active Goodreads account. "Social media is a platform of enormous potential for business," he says. "Being a man interested in the business of book-selling, it is only logical for me to pursue this and to experiment with something that's so powerful and simple to use." On his social media platforms, he responds to customers, posts updates on Books Kinokuniya's books as well as anything else he find interesting. As long as Books Kinokuniya maintains a close relationship with its customers, Mr Chan thinks that the brand will be able to weather whatever the future holds. "As long as we have a good team of people and continue that connection, I think the store will be all right," he says. "I think we've managed to do a good job of honing the brand of Books Kinokuniya, of honing the skills of the people who hold the brand and providing an experience within the store. I think that will compel customers to come back again and again." "Sometimes, I torture her by showing her the prices now. 'Mum, you threw away this one, remember?'" "It's quite an awesome store, it's so old and all the lifts closed by shutter. They made a creepy sound when you went up." "To me, it's a long-term highlight. It's seeing all my team members grow as managers and leaders of people, and as great booksellers. That is really a highlight that I would not have seen if I had not stayed here for 14 years." "In those days, being anti- establishment was the rage. It was the days of the hippie movement. I had the second longest hair in my company before they cut it when I joined NS." "I learnt that the book industry is tough. We worked six days a week but anyway in those days, we were young, ambitious and we wanted to make sure we did things to our best ability."